COAR Roadmap: Future Directions for Repository Interoperability stresses that still many challenges remain with improving data (based on semantic) interoperability. Besides the necessity to use the most common standardized controlled vocabularies, metadata and indicators, the interoperability issue is also in line with the objective of striving for FAIR data, because you need to ensure you deliver Linked Data models that allow the publishing and connecting structured data on the web. Linked Data (LD) - a term coined by Tim Berners-Lee in his design note regarding the Semantic Web architecture -, refers to a set of best practices for publishing, sharing, and interlinking structured data on the Web. LD aims to connect related data formerly isolated in small or large repositories (often called “silos”) and not previously linked. ... support the selection of appropriate encoding strategies for producing meaningful Linked Open Data (LOD)-enabled bibliographical data (directly or indirectly), thus harmonizing the encoding description (metadata properties) according to Linked Open Data (LOD)-enabling strategies. 1.) Is there any uniform well-structured metadata modelling and encoding methodology (in spite of concurrent proliferation of metadata standards) able to ensure maximum interoperability among digital objects (confined in heterogeneous environments) on the frontline of Linked (Open) Data? Different communities (e.g. Metadata2020, FAIRsharing) are working hard to find solutions to common community-specific problems linked to the creation and use of metadata and other vocabularies. 2.) What are the significant metadata properties related to the reuse of digital data and how can these significant properties be identified and expressed, while ensuring accuracy, enhancing and preserving the meaning of data conveying specific information and knowledge of their user communities? LODE-BD Recommendations 2.0 - Report on how to select appropriate encoding strategies for producing Linked Open Data (LOD)-enabled bibliographic data were born to provide clear practical solutions for these cutting edge issues. As a reference tool, LODE-BD provides assistance on how to make decisions on modeling (in both depth and detail) of significant metadata properties, their encoding (that enables data re-use) and implementation (with better response to local or specific needs) insuring sharing of meaningful (with clear purport) and comprehensive (both to humans and Web engines) bibliographic data. With regard to metadata encoding, LODE-BD clarifies what kind of Vocabularies and Knowledge Organisation Systems (KOS) values (literal form representing or URI identifying a concept) should be used to produce high-quality LOD-enabled bibliographic data, easily exchangeable through repositories and sharable on the Web of Data. 3. Qualify metadata properties with values of widely adopted encoding schemes and Knowledge Organisation Systems (KOSs), expressed by means of Semantic Web conventions (for this purpose, discover, e.g., AgroPortal: an ontology portal/repository dedicated to the agronomic and plant domains) . 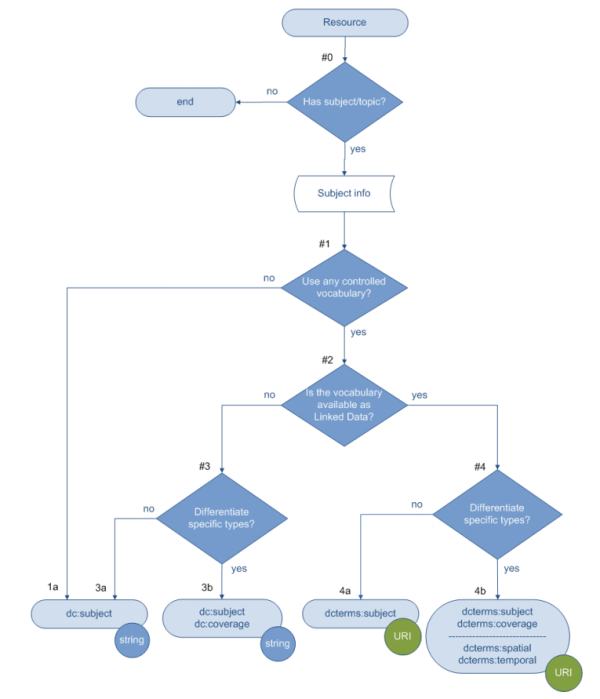 The core component of LODE-BD contains a set of recommended decision trees for common properties used in describing a bibliographic resource instance. Each decision tree is delivered with various acting points and the matching encoding suggestions. The full range of options presented by LODE-BD will enable data providers to make their choices according to their development stages, internal data structures, and the reality of their practices. watching a Lecture 'Controlled vocabularies and PHAIDRA International' (by Imma Subirats, during the 20th International Conference on Electronic Publishing entitled 'Positioning and Power in Academic Publishing: Players, Agents and Agendas', June 7-9 2016 at Göttingen State and University Library). Requirements of the PHAIDRA Classification Server, by Kopacsi, in GitHub.